Finally you will have an indoor space that will still let you sit and relax in your garden, thanks to the Hartwood 6′ x 6′ FSC Pressure Treated Charlton Summerhouse. Sitting in here with the door open on a warm summer’s day is going to be wonderful, even more so with a drink in your hand. The compact size of the summerhouse makes this perfect for those of you with smaller gardens who would still like to have a space to relax. Even with its smaller size, you still will be able to fit all you would need to have a relaxing time inside of here. The design of the summerhouse is just fantastic and this is certainly going to be a very positive addition to your garden. 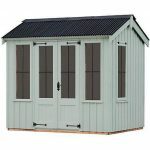 With smooth and well made shiplap cladding that is made from pressure treated timber, this is one very strong and long lasting summerhouse. It is not just the cladding either, the impressive frame is a huge part of what makes this such a robust structure. That high apex roof is very well made and is going to keep the rain from sitting on the top trying to sneak inside. 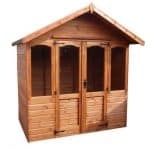 Even with the very reasonable price tag this is still a summerhouse that is made from some very fine materials. Does your house simply have no place you can escape from the kids and enjoy five minutes peace? Are you sick of not being allowed to watch the match in the living room? Or do you just want a space where you can sit, relax and enjoy a glass of wine on a nice summer’s day? Well thanks to the Hartwood 6′ x 6′ FSC Pressure Treated Charlton Summerhouse, you can have a classy looking place to enjoy some quiet time and also make your garden look better. This is one of the smaller summerhouses we have seen, but it is large enough to house a chair, table, shelves and other such items. 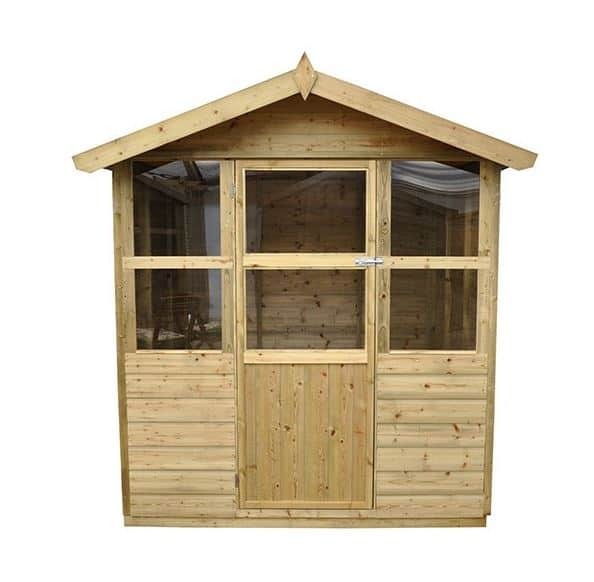 6 feet 6 inches wide and 6 feet 8 inches deep are the dimensions you have to play with and honestly this size of summerhouse is made for smaller gardens and we are fine with that. The height though is very surprising, as not only is the ridge height just over 7 feet high, even the eaves height are very reasonable at 5 feet 9 inches. The fact that the apex roof is so high is great as it not only gives you plenty of headroom and forces the rain to run off, it is also so high that the kids cannot climb on top of it and pretend they are Superman by jumping off it. Which if they did, the roof would be able to take the weight as it is made from strong, solid sheet boarding and covered with some very durable sand felt. They have also given the roof a lot of personality by having this little overhang on the front of it. The reason that the shiplap cladding has such a striking look to it is because all of the timber has been pressure treated to make it resistant to rot and also be that extra bit stronger. The cladding is 7 mm thick which is a little slimmer than what we would have expected, but it is still strong enough that it does not cause us any concern. In general we really love the way this cladding looks. The shiplap cladding is very strong, but this is accompanied by a very solid frame which is 28 mm x 28 mm. The summerhouse is very robust and this is because the cladding and the frame form a tag team so impressive that it is only a matter of time before they become tag team wrestling champions! Being serious though, we know a frame is not the most interesting thing to talk about, but the frame they have used here is just fantastic and will really make sure this summerhouse lasts for many years. Under your feet while you are kicking back relaxing or lying on the floor from drinking one too many, is some solid sheet boarding. We are fine with them using this boarding and do feel that it is going to be able to take a lot of weight. The boarding is kept off the ground and also made that little bit more robust thanks to the floor joists that they have used. 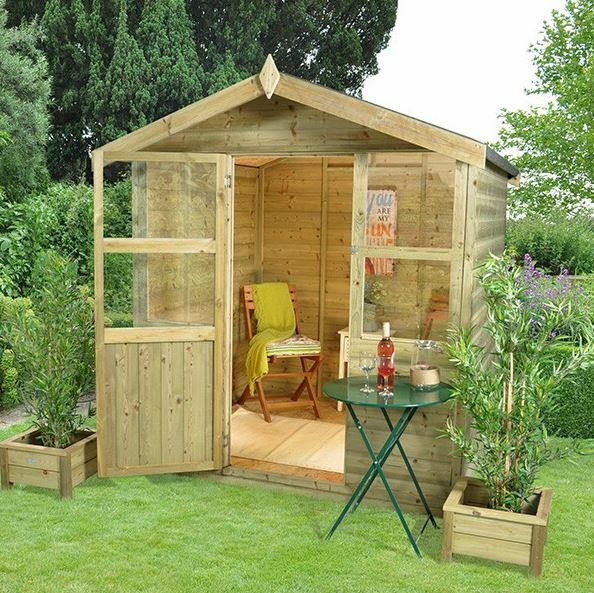 With the Hartwood 6′ x 6′ FSC Pressure Treated Charlton Summerhouse being pressure treated, it means that you can relax even more as you will not have to treat the wood on an annual basis. This is sure to make this a summerhouse even more attractive to those of you who want a structure that is low maintenance. You know that the manufacturer has a lot of faith in the pressure treatment process the timber has gone through as they are confident enough to give you a 15 year anti rot guarantee. On the front of the summerhouse is a single door. Now even though this is a single sized door, at 5 feet 5 inches high and 2 feet 2 inches wide is still a very nice size. The door is very durable and with the hinges they have used we do not see it starting to sag as the years go by. They have also made sure the door stands out very well, not just because of the windows on it, but also the way they have used vertical cladding on the bottom of the door. The front of the summerhouse has some very attractive windows, three in total which give the appearance of six thanks to the clever placement of a strip of wood. We love this and feel that it looks so much better than if they were to have just had the three large windows on there. These are not glass windows, they are made from this very strong and shatterproof styrene. You can clearly see the pad bolt that is going to be used to keep the door closed, but if you do have some important things in here, then you will want to install some kind of locking mechanism on there. While there are no windows on the sides or back of the summerhouse, those front windows do make this very easy to look into. So this is not something that you will be wanting to sit in with your pants off. But if you do, then you could always add some curtains or blinds. While the most obvious way to change the look of the summerhouse is with a coat of paint, one other thing that you could do which would be fun is add some kind of hanging decoration to the overhang. 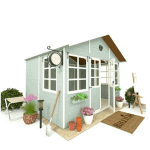 There is a 6′ x 6′ Ecobase Plastic Shed Base which on one hand does sound very handy, especially if you are going to be placing the summerhouse on grass, but at £95.99 it is a little overpriced for our liking. The cladding and the frame is just incredible and the most high quality aspects of the summerhouse, but the rest of it is very well done also. So in general, we are very pleased with how this has turned out. There is not really anything about this summerhouse that makes us worried about it starting to fall to pieces in the future. The pressure treated timber and the other selected materials will ensure this lasts for a very long time. You do not need a measuring tape to know that 6 x 6 is not huge, but it does offer far more possibilities than you would think, especially if you are clever with how you organise your furniture. 4 – 6 hours is the average time that something like this usually takes to install. If you have a friend who is skilled in DIY helping you out, then it will be a much smoother, fun experience. We feel that even people who usually shy away from DIY will not have to many problems with this. 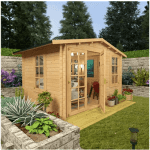 This is one lovely looking summerhouse and the pressure treated timber and overall build makes it something that is also going to give you many years of use. Overall, we are very happy with the asking price of this. Final Thoughts: We know that the size of the Hartwood 6' x 6' FSC Pressure Treated Charlton Summerhouse may be an issue for some people, but if you can look past that you will see what an awesome summerhouse this is. 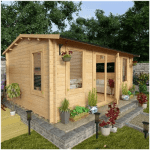 We are really impressed with this and for a smaller, somewhat budget priced summerhouse, you really are going to struggle to top this as it pretty much does everything right. It is so well made that you are going to be able to enjoy this for many years. We are sure you are going to have a lot of fun in here and we have no issues highly recommending this.